Cyberoam, a division of Elitecore Technologies, is a vendor of identity-based network security products including UTM security, logging and reporting and secure remote connectivity appliances and data loss prevention software. Why we need to hack cyberoam ? Many colleges uses cyberoam firewall to secure internet connection. And the internet in college is only educational purpose only so the network admin blocks some site like facebook , YOUTUBE and all the social networking site and songs site like Freshmaza etc. And many sites using mediafire to upload their files.and in my college mediafire is also blocked.so I have found the way to access all the sites. 3.internet download manager (if you want to download from blocked sites) lets start..
Login in to cyberoam ,Now you have mozilla firefox , proxy , and internet download manager. well now open mozilla firefox and go to tools > Option > Advanced > Netwok and click on setting. 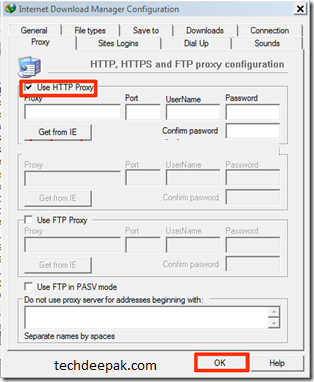 Now select option “manual proxy configuration” and add your proxy and port as shown in above figure. and select “use this proxy server for all protocol” and hit ok now try to access google if you are able to access google then the proxy works if you are not able to access google then replace proxy ip address with another proxy ip address. Now if you want to download something from blocked site then open IDM and click on setting and select proxy. select “use HTTP proxy” and hit ok now start downloading from blocked sites.